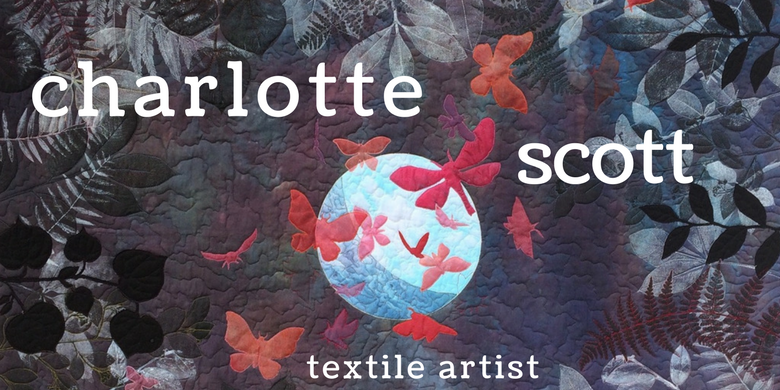 Organic, Modern, Graphic Quilts! OMG quilts, a new idea? 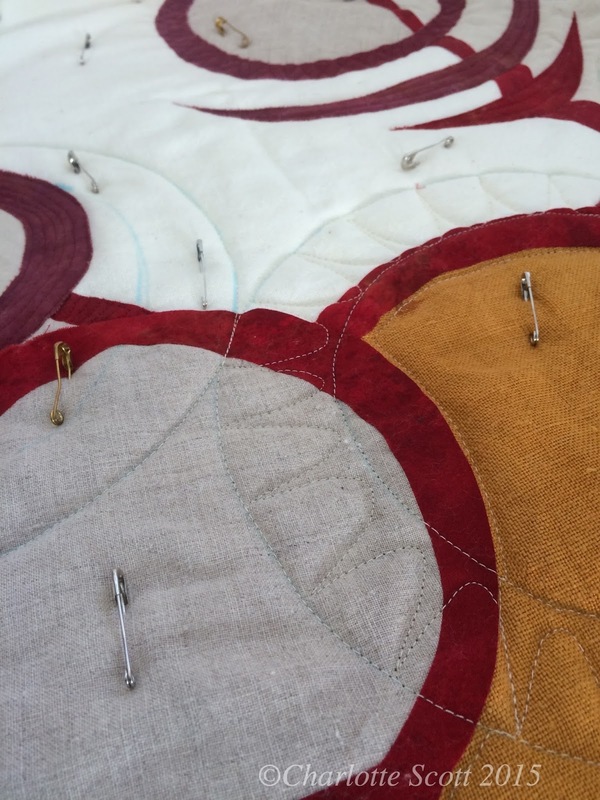 Helen Godden is an Australian quilt artist (find my podcast interview with her here), who has been working with a couple of colleagues - Suzanne Hyland and Michelle Pearson - on a new idea. She calls it OMG! This stands for organic, modern, graphic quilts - a variation within the modern quilting movement. There is a OMG Facebook group that was started in April and it's been growing with exponential speed. Currently there are 895 members. "Teaching at Handi Quilter academy Utah 2014, Suzanne and I were discussing the sweeping popularity of the Modern Quilting style. For me I love the space and importance given to lots of free-motion quilting but ...anyone who knows me knows...I don't piece! 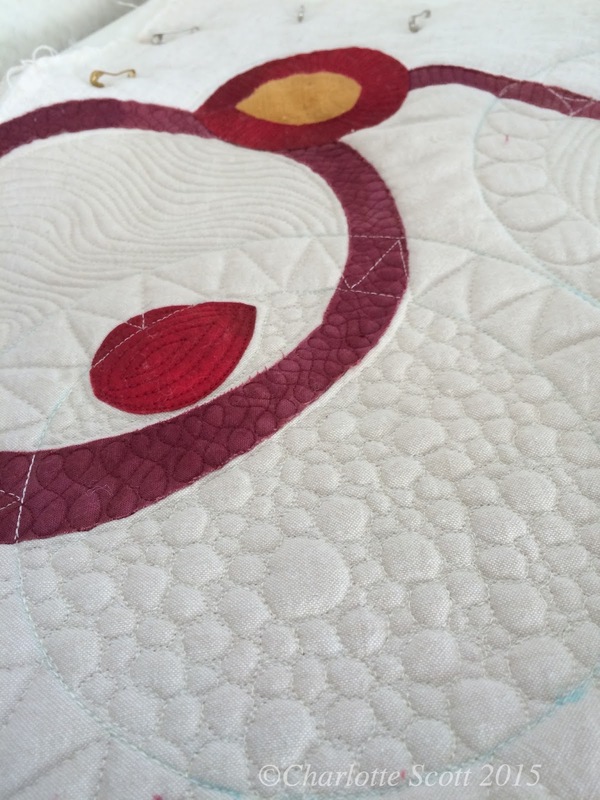 Piecing seems to be fairly integral to Modern quilting. As always my mouth engages before my brain has slipped into gear and I thought out loud and said "Why does Modern have to be pieced? Why can't it be more organic?" I jumped up, grabbed a marker and wrote OMG in large letters on the white board and announced 'Organic Modern Graphic quilts.'" 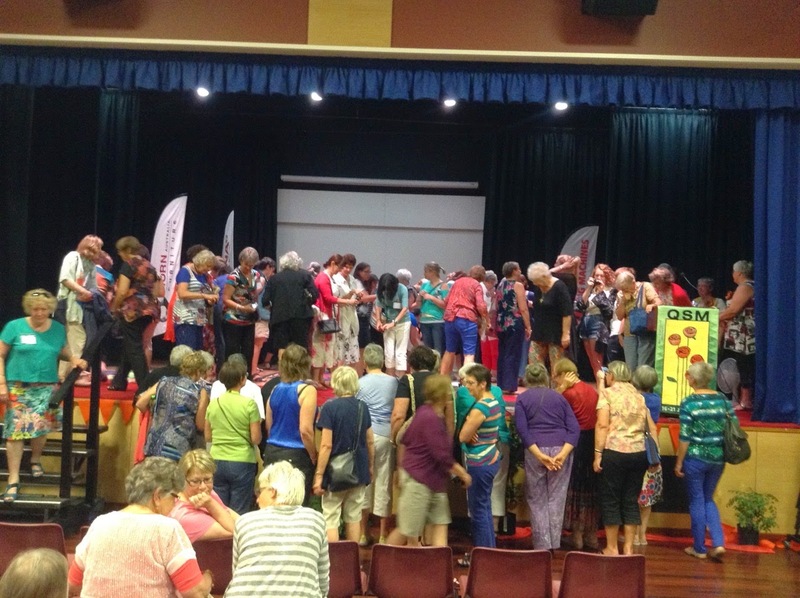 Helen presented the idea at the Canberra Modern Quilt Group in April and it was suggested she start a Facebook group. The idea behind the Facebook group is to encourage members to make OMG quilts, Helen calls it,"a non-profit quilting stimulator". There are quite strict guidelines as to what constitutes an OMG piece (appliqué, non-pictorial, size restrictions, quilting integral to the design etc) but, if it fits within the criteria, it is accepted as an OMG quilt and awarded an OMG order of creation number. Helen's OMG quilt called OMG #4 UBER, just won first place in the Negative Space category of the Kiama Modern Quilt Show. OMG quilts #1, #2 and #3 were also all created by Helen, although #3 is now known as 'Onion formerly known as OMG #3', which reflects a guideline change that occurred later on. OMG #5 was created by founder Michelle Pearson, but from #6 onwards there is a whole variety of creators. 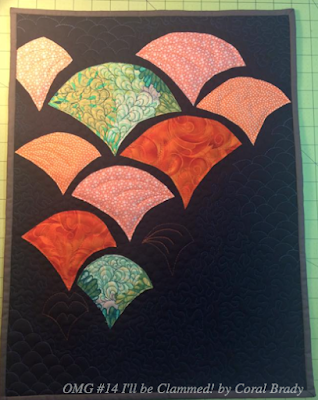 This is Coral's OMG quilt, called OMG #14 I'll be Clammed! Coral, a quilter living in Australia (find her at @coralquilts on Twitter and Instagram) talks about making it: "I was having a pretty stressful week, so busting out an OMG was a great stress reliever. I always wanted to make a clamshell quilt, but paper piecing was a lot of work, so I decided to use the raw edge appliqué technique to do it on my OMG instead." Normally, really strict rules turn me off. But, as Twyla Tharp talks about in her book "The Creative Habit" sometimes restrictions can really spark the creative juices. And, judging by the popularity of the group and the number of OMG quilts being made (33 at last count, and this doesn't include the OMG children, which are quilts made from the offcuts and leftovers of the parent OMG), it appeals to other quilters too. Coral states,"I think the appeal is the freedom of the raw edge appliqué. Any shape you want to make. Also you can make them pretty quickly, while still doing some fun and exciting FMQ." I think another aspect that appeals to me is that this seems to be something new. A new concept, which is pretty hard to find in this world today. 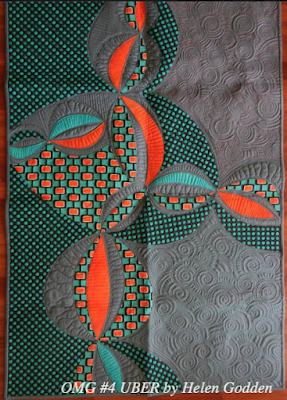 And I don't mean making appliqué, abstract quilts is new, but the whole OMG group etc is new, just like the modern quilting movement was new and appealing when it first appeared as a concept. Perhaps it is also the sense of community that in attractive? I think there is a bit of breakdown in some of the traditional forms of clubs and guilds, and Facebook, Instagram and Twitter groups are replacing that sense of belonging we get from hanging out with people who 'get' what we do. And how could I forget to mention blogs! I don't know where I'd be without my blog followers! So I watched for a little while to get the concept and then I jumped in and decided to make one. I'm working with the second to largest size allowed, 30 x 40 inches. My design started with free cut circles but I wanted to make the background an integral part of the design instead of plain fabric (I hate BB's - boring backgrounds), so I cut background pieces out of several different neutral fabrics and one orange/brown linen napkin that just jumped up and demanded in. These backgrounds were glue basted to the back of the circles and excess cut away to reduce bulk. Now I'm busy quilting, and I tell you - this much concentrated free motion quilting is really improving my skills! Once it's done, I'll have to submit it for consideration by HHH (hard hat Helen) and see if it is approved for an OMG number. It's an interesting process - kinda like seeing if your quilt is juried into a show. 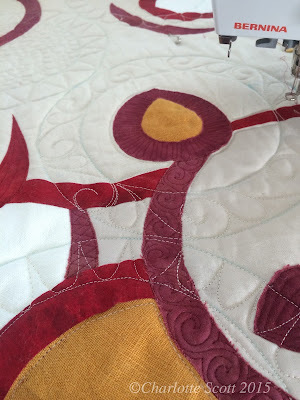 Helen often provides a critique, which I think expands the thought processes about what an OMG quilt is, and what area that particular OMG quilt either excelled in or perhaps needed more work in. So what do you think about the concept of OMG? Am I right in thinking that it's something new? Are you part of OMG, and if you are, what appeals to you about it? The Facebook group is called OMG quilts - go take a look and let me know your thoughts. So after my Monday Musing yesterday (maybe I should call it Monday Moaning!) I thought I better post some actual content on this bog of mine. And seeing as I was rambling about doing a creative practice project making complex cloth (and I still am considering doing that, I'm just nutting out the way I would actually structure it), I thought I'd post a little video tutorial for you on doing some basic shibori fabric folding to pattern cloth. 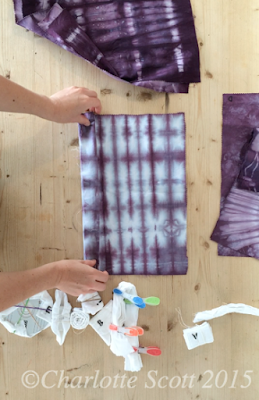 Shibori is a Japanese term. It basically refers to the many ways of manipulating cloth - be it folding, tying, stitching, or clamping - that can be done before placing the fabric in a dye bath. 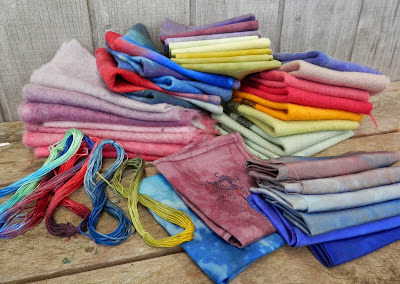 There are beautiful examples of shibori from highly skilled artisans that you can find if you do a little web searching, but this video shows you nine simple ways to secure your fabric using basic household items. Tie or fold your fabrics first and have them ready to go in a small container or plastic zip-lock bag. Tie your bundles using DRY fabric. Wear gloves, work in a well ventilated area, and use a dust mask when the dry dye powders are exposed. Remember to use hot water for best dissolving. Put ingredients into a jug and stir well, or a capped bottle or jar and shake well. Work quickly as the dye powder starts to react with the soda ash straight away. Pour this solution onto your tied or folded bundles. Slosh them around to make sure dye solution has covered them. Leave to ‘batch’ in a warm place for at least four hours. Rinse the bundles while they are still tied. Once the water is clear then you can untie them, keep working in a bucket of water or under a running tap. Then rinse again. I think my blog is lacking a little bit in content. I know I've said that before, but I still don't think I've remedied it. So I'm thinking (musing, hence the title, but I like alliteration) that I should instigate a schedule of weekly posts with some sort of regular weekly content. I guess I've been musing about what I want to use my blog for. This is related to my consolidation process that I'm going through. It's nice to have a record about what I've been up to. And I like that it gives me a venue to publicise my work and my classes. But now that my kids are getting older I don't write much about them, so what else can I put here? How can I use it to be a better artist? Yes, the podcast is fun and I'll continue to do that, but is there more that this blog can offer me? I think so, but I've been trying to work out exactly what that is. I've been playing with the idea of starting some sort of creative practice project*. I think one of the ways to keep strengthening my own style is just to make lots of work. Have you ever read that story about a ceramics tutor who divided her class into two? One half was to be marked on volume of work produced over the term, the other half had to produce only one single pot and be marked on that. Guess which half produced the best work by the end of the term? *A creative practice project it something creative done regularly - a journal quilt every month, a zentangle per day, you've probably seen or read examples of them as they seem pretty popular around the blogosphere in recent years. So yes, I need to produce more work. How can I use my blog to help me achieve that? I do post what I'm working on quiltwise, but sometimes there are constraints about what you can publish if you are wanting to enter certain exhibitions. And large, finished pieces of textile art take a lot of investment in terms of time, who wants to see similar photos of the same quilt week after week? So, is there a smaller creative practice project I could do? I've been tempted to join into other people's year long challenges or projects, but just haven't found the right one for me. Yet I think it would be an enriching experience, a way to push through creative barriers, to do many small acts that add up to something in the end. Any finished article takes a lot of investment, but what about something unfinished? I listened to Meighan O'Toole's podcast where she interviewed Jen Hewett, a printmaker who did a 52 prints challenge (she's onto another 12 month long project now because she found her first one so worthwhile) and as I listened, I realised that she was not making finished items, but just committing to making a print per week. Whether it got into a finished item or not was irrelevant. A sketch, a print, lots of things come to mind for me, but what I keep coming back to is complex cloth - surface design but in layers so that it becomes complex and almost a piece of art itself. And then I could tie my creative practice project back into the blog. Being accountable to myself but also to you, dear readers. I'd use my blog to muse about the process, I'd set up reminders to blog regularly about what it is I have learnt and by the end of the project I'd not only have a body of work, but I would also have process notes and journals, and ideas and feedback from others. I'm going to muse more about this idea for a little while, but thanks for reading my random musings, and I'd love to hear your thoughts on creative practice projects and if you're interested in starting up one too. This is my last interview from Manawatu Symposium 2015, but definitely NOT my least. 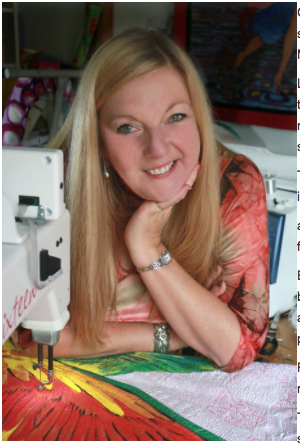 I was so thrilled to talk to Carol Veillon from Quiltmania magazine. She travelled all the way from France to be a merchant at symposium and was just so lovely to talk to. Carol's journey is amazing. She began with just an idea to start a patchwork magazine because there was nothing that appealed to her. From selling 12,000 copies of the first edition to being published in three languages, to being a book publisher and running a quilt show - a totally inspiring story. 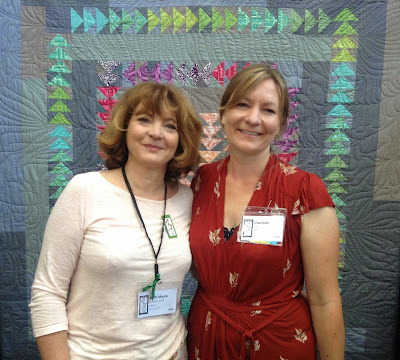 The stunning quilt we are standing in front of (and that Carol mentions in the interview) was on the cover of Quiltmania 105, designed by Valori Wells. One of the consolidation tasks I'm doing in my quilting life is putting together a quilt register. It would make my life a lot easier if I had all the details (especially the size) of all my quilts at my fingertips. And whilst inputting one of my latest quilts, I realised that I had never shown you the final product. This is 'Three Stand Sentinel' and it's 18 inches by 34 1/2 inches. It was begun in a class by Sue Benner, then grew and evolved once I got it home. I showed plenty of in progress shots, but never a finished one. I'm still not entirely happy with my watermark program. I'm now using Photobulk and I still think it notches up the saturation of my colours. Any suggestions? Some detail shots for you. The background is monoprinted and hand dyed fabric, then the ripples, wharf posts and birds are fused collage. Mostly using my hand dyes but some repurposed shirts and commercial solid fabrics made it in too. I used a little organza for the shadows on the poles and I used prismacolour pencils for the faces. Can you see where I butted up two background panels and joined them using a wide zig-zag? No quilt police around here! And then lots of free motion quilting to hold it all down. To finish it I went with a binding. I liked the lift the turquoise solid gave the quilt and the quilt was way too stiff to attempt a facing, which is my usual way of finishing off art quilts. I'm really pleased with the final product. I think the hardest thing was coming up with a name. Some quilters seem to be able to do that effortlessly. Not me. And the seagulls seem to like it too. Cheeky! I would have cried if he'd pooped on it, but I had to grab a shot before I scared him away. Back in February I mused on what I wanted from this year. Now it's May, Autumn is heading for Winter fast, and I thought it might be time to revisit that blog post and see where I'm at. 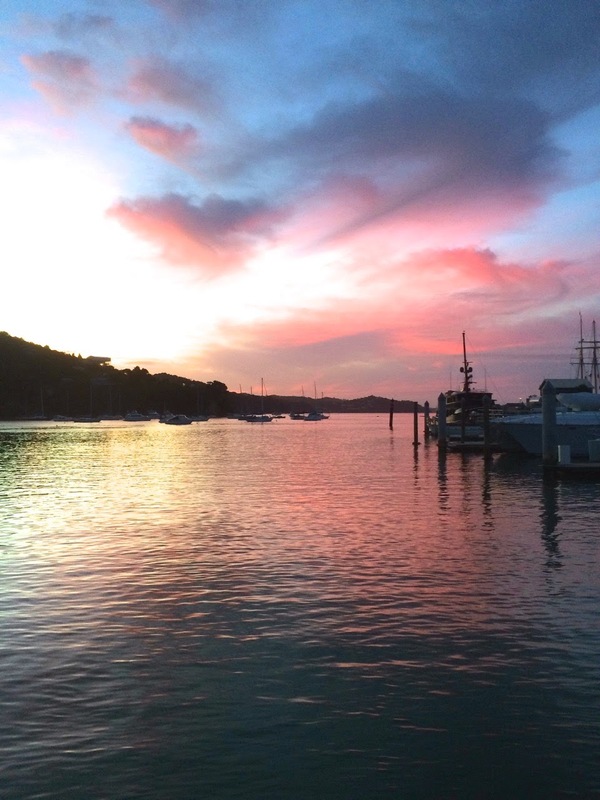 "I want to settle into this boat life and make it work for us. I want to strengthen my quilt making and further develop my own style and way of working. 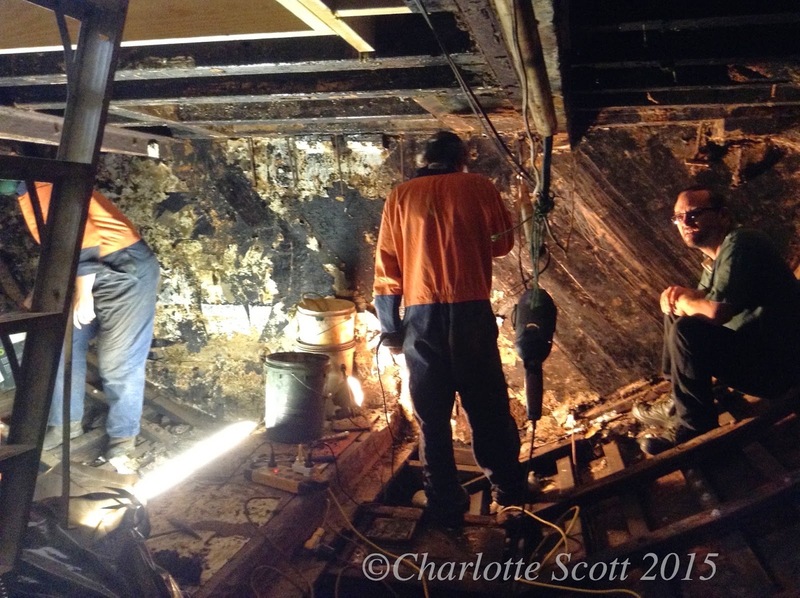 I want to gather my far-flung quilting supplies and fabrics and make an effective working space here on MV Cerego. I just want to settle in and stabilise ourselves in all respects before we stretch our wings any further. So no goals or resolutions for me. Just a word to remember (before I get excited and hare brained about anything new and shiny)." So how's it working out for me? As for family and boat life, I think we've really settled in well. In fact it's coming up nine months that we've lived here and I'm not regretting it yet! The weather has cooled down and we've had some rainy days but, so far, so good. 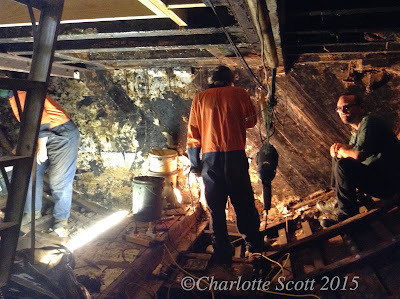 The boat is becoming more and more sorted with every weekend - bookshelves get put up, deck wash pumps get wired in, little leaks get fixed - it's really becoming a home. Flashback: what the kid's cabins looked like when we first bought Cerego. I've got a daily routine going. It had to change a lot. Back in our house I could sew in the evenings but here I can't because of noise and kids sleeping etc. So I try to do a lot more sewing during the day. Evenings are for dishes (no dishwasher! ), computer work and husband socialisation. We talk more now - that can't be a bad thing right?! We haven't bought any houses/boats/businesses so we are pretty stable in that respect. Husband's businesses keep him pretty busy, but living five minutes away has helped the stress levels and made it easier with combining my work, his work and kid duties. And I don't think I've been distracted by anything new and shiny (except Instagram - I caved and signed up, I'm madquiltlady there if you want to find me). The kids are doing their kid things. It makes it easier living close to the school. Sports and lessons need less driving and less organisation, and they can be more independent. I've noticed big gains in their maturity. So yes, I feel settled. We've slowed down and kept new projects to a minimum and we're reaping the benefits of such a big life change. That's it for consolidating the life side of things. I'll write more about the quilting side of things another day. This was a really fun interview! Helen Godden is an Australian Art Quilter extraordinaire. When I attended Manawatu Symposium in January, Helen generously agreed to an interview and although it's fairly short and sweet, it's packed full of info and interesting conversation. I forgot to get a photograph of Helen and I, so I stole this shot from Helen's website! Helen makes wonderful quilts, she teaches and travels and lectures. She is down to earth, practical and funny. Helen also has a very talented daughter, Ineka, who recently won a trip to Turkey with her quilt that commemorated the 100th anniversary of the ANZACs (Australian and New Zealand Army Corps). I captured the crowd after Helen's lecture. Helen spread her quilts out and generously let people examine them up close, photograph them and even TOUCH them! 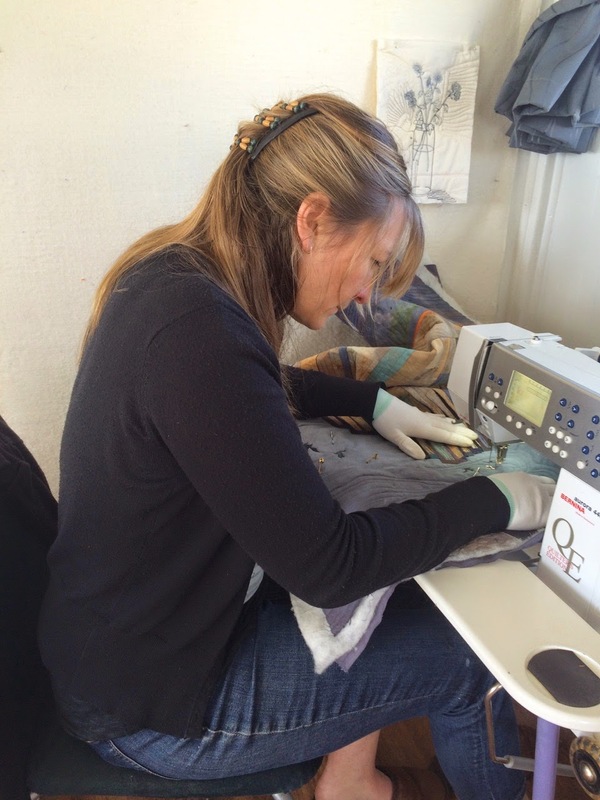 Helen is also an ambassador for Handi Quilter, and recently developed the couching foot for the HQ machines. She has been doing lots of work experimenting on how to make beautiful artworks with the couching feet and you can go here to see Helen in action. And, just for fun, here are the lyrics to the song "Redback on the Toilet Seat" that you hear me mention! Thanks so much for taking the time to talk to me Helen!